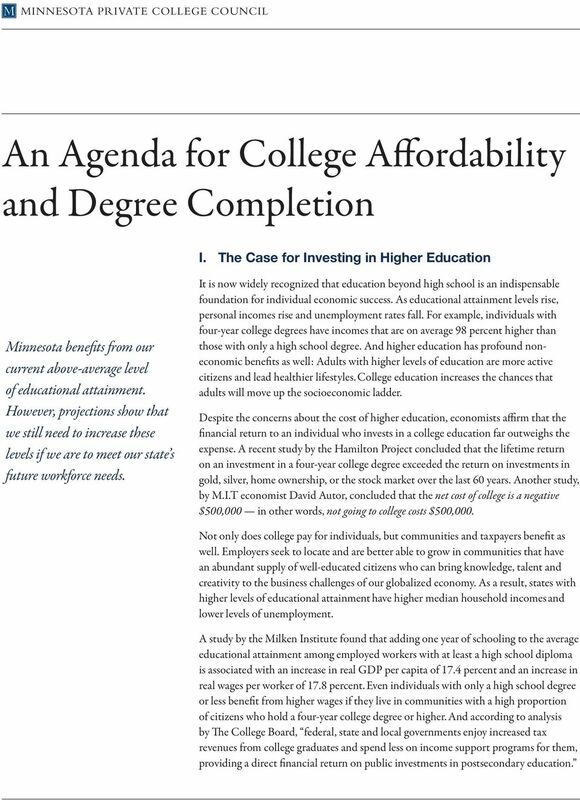 Download "An Agenda for College Affordability and Degree Completion"
1 MINNESOTA PRIVATE COLLEGE COUNCIL An Agenda for College Affordability and Degree Completion I. The Case for Investing in Higher Education Minnesota benefits from our current above-average level of educational attainment. However, projections show that we still need to increase these levels if we are to meet our state s future workforce needs. It is now widely recognized that education beyond high school is an indispensable foundation for individual economic success. As educational attainment levels rise, personal incomes rise and unemployment rates fall. For example, individuals with four-year college degrees have incomes that are on average 98 percent higher than those with only a high school degree. And higher education has profound noneconomic benefits as well: Adults with higher levels of education are more active citizens and lead healthier lifestyles. College education increases the chances that adults will move up the socioeconomic ladder. Despite the concerns about the cost of higher education, economists affirm that the financial return to an individual who invests in a college education far outweighs the expense. A recent study by the Hamilton Project concluded that the lifetime return on an investment in a four-year college degree exceeded the return on investments in gold, silver, home ownership, or the stock market over the last 60 years. Another study, by M.I.T economist David Autor, concluded that the net cost of college is a negative $500,000 in other words, not going to college costs $500,000. Not only does college pay for individuals, but communities and taxpayers benefit as well. Employers seek to locate and are better able to grow in communities that have an abundant supply of well-educated citizens who can bring knowledge, talent and creativity to the business challenges of our globalized economy. As a result, states with higher levels of educational attainment have higher median household incomes and lower levels of unemployment. A study by the Milken Institute found that adding one year of schooling to the average educational attainment among employed workers with at least a high school diploma is associated with an increase in real GDP per capita of 17.4 percent and an increase in real wages per worker of 17.8 percent. Even individuals with only a high school degree or less benefit from higher wages if they live in communities with a high proportion of citizens who hold a four-year college degree or higher. And according to analysis by The College Board, federal, state and local governments enjoy increased tax revenues from college graduates and spend less on income support programs for them, providing a direct financial return on public investments in postsecondary education. 2 02 By 2020 Minnesota will need 74 percent of its workforce to have at least some college education, according to the Georgetown Center for the Economy and Workforce. And more than half of those jobs will require a four-year degree or higher. Simply put, we must further boost our level of educational attainment for Minnesota to thrive economically. II. Minnesota s Challenges For Minnesota to meet the level of educational attainment needed in the coming decades, we must address two significant barriers to college success: college affordability and on-time degree completion. Combined, these two challenges contribute to the growing educational achievement gap in higher education. College Affordability Although the rise in net tuition costs at colleges has slowed in the last several years, affording college is a major challenge for many families. In a recent survey, Minnesotans said the cost of college was the single biggest obstacle to completing a college education. This affordability challenge has been exacerbated by the fact that real (inflation adjusted) median family income across the state declined by 12 percent between 2002 and Low-income families as well as those whose incomes fall just above eligibility for financial aid struggle to afford college. The affordability challenge will only grow in the future. An increasing share of Minnesota families with children have low or declining incomes. For example, 34 percent of today s 10th graders qualify for free and reduced school lunches, but that percentage is 43 percent of today s first graders. And Minnesota is growing more ethnically and racially diverse. Among students of color, a disproportionate share are from low-income families. On-Time Degree Completion A high percentage of Minnesotans 78 percent enroll in college within two years of graduating from high school. But, for more than half of these students, it takes too long to complete a degree and some never complete a degree. For first-time, full-time students seeking bachelor s degrees in Minnesota, only 44 percent complete their bachelor s degree in four years or less. For first-time, full-time students seeking a two-year degree or certificate, only 41 percent complete their degree or certificate on time or transfer. 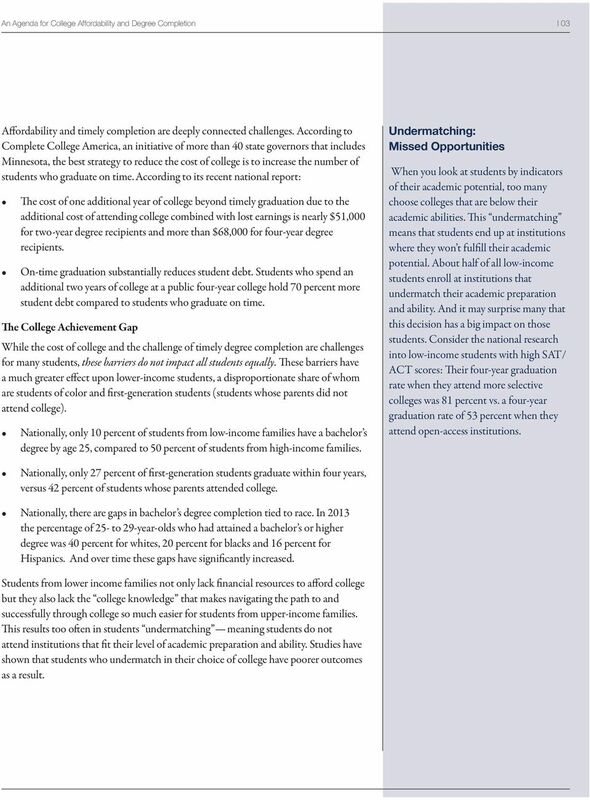 3 An Agenda for College Affordability and Degree Completion 03 Affordability and timely completion are deeply connected challenges. 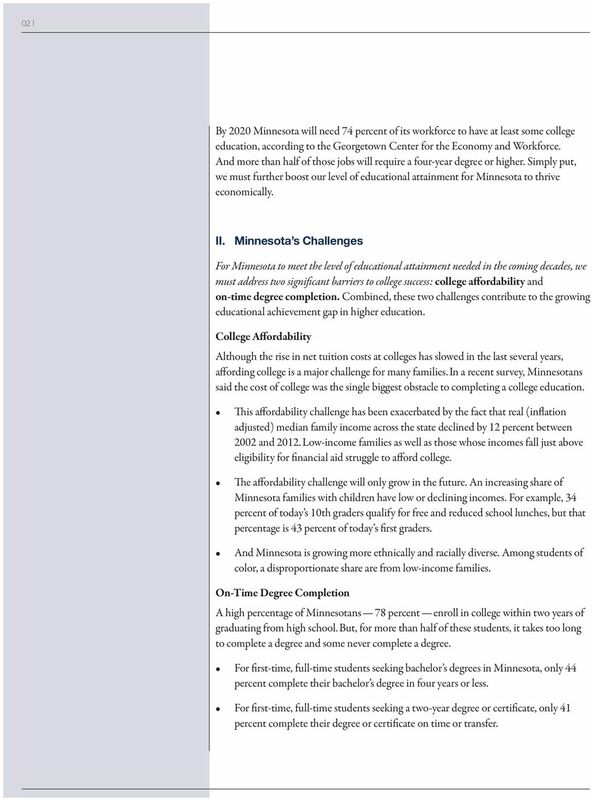 According to Complete College America, an initiative of more than 40 state governors that includes Minnesota, the best strategy to reduce the cost of college is to increase the number of students who graduate on time. According to its recent national report: The cost of one additional year of college beyond timely graduation due to the additional cost of attending college combined with lost earnings is nearly $51,000 for two-year degree recipients and more than $68,000 for four-year degree recipients. On-time graduation substantially reduces student debt. Students who spend an additional two years of college at a public four-year college hold 70 percent more student debt compared to students who graduate on time. The College Achievement Gap While the cost of college and the challenge of timely degree completion are challenges for many students, these barriers do not impact all students equally. These barriers have a much greater effect upon lower-income students, a disproportionate share of whom are students of color and first-generation students (students whose parents did not attend college). Nationally, only 10 percent of students from low-income families have a bachelor s degree by age 25, compared to 50 percent of students from high-income families. Undermatching: Missed Opportunities When you look at students by indicators of their academic potential, too many choose colleges that are below their academic abilities. This undermatching means that students end up at institutions where they won t fulfill their academic potential. About half of all low-income students enroll at institutions that undermatch their academic preparation and ability. And it may surprise many that this decision has a big impact on those students. Consider the national research into low-income students with high SAT/ ACT scores: Their four-year graduation rate when they attend more selective colleges was 81 percent vs. a four-year graduation rate of 53 percent when they attend open-access institutions. Nationally, only 27 percent of first-generation students graduate within four years, versus 42 percent of students whose parents attended college. Nationally, there are gaps in bachelor s degree completion tied to race. In 2013 the percentage of 25- to 29-year-olds who had attained a bachelor s or higher degree was 40 percent for whites, 20 percent for blacks and 16 percent for Hispanics. And over time these gaps have significantly increased. Students from lower income families not only lack financial resources to afford college but they also lack the college knowledge that makes navigating the path to and successfully through college so much easier for students from upper-income families. This results too often in students undermatching meaning students do not attend institutions that fit their level of academic preparation and ability. Studies have shown that students who undermatch in their choice of college have poorer outcomes as a result. 4 04 How private nonprofit colleges are making a difference Our 17 nonprofit colleges and universities are a good choice for many students. They re more likely to succeed and graduate on time if they enroll at our colleges than if they attended the state s public institutions our four-year graduation rate is the best in the state. Credit personalized attention and strong student support for the difference. That high graduation rate means they are able to stop paying tuition sooner and move on to start their careers. And Minnesota benefits from a welleducated workforce. Minnesota private colleges serve a diverse student body, including many students for whom affordability and completion are difficult challenges: Thousands of lower-income students are enrolled at our institutions. In fact, 27 percent of our undergrad students qualify for the federal Pell Grant that targets students from low-income families. That s a larger share than at the U of M and just two percentage points below the level at MnSCU s universities. Our colleges enroll significant numbers of students of color: 19 percent of our domestic undergrads are students of color. That s the same share as at the U of M and higher than at MnSCU s universities. Many of our students do not enroll full-time straight after high school. In fact, 29 percent are transfer students, many from two-year institutions; 13 percent are part-time students; and 14 percent are independent students, meaning they re 25 or older. 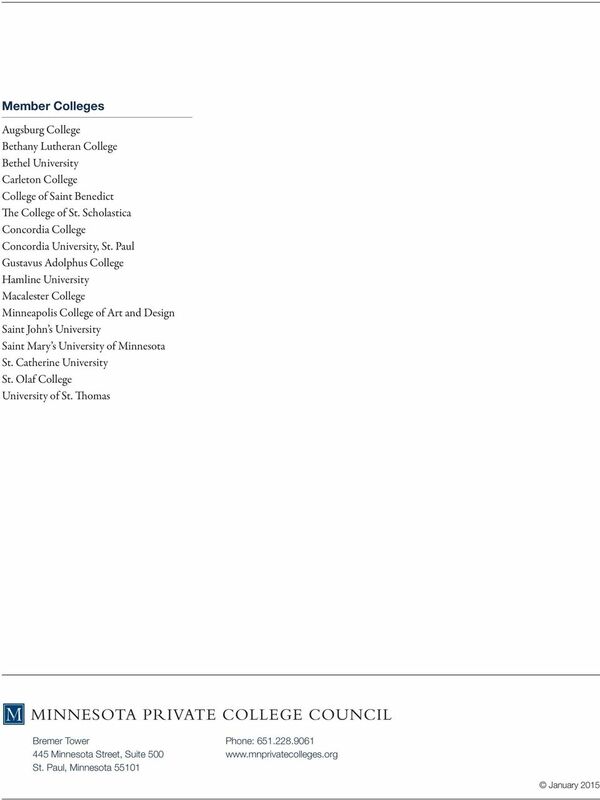 $25,000 $20,000 $15,000 $10,000 $13,559 First-year Net Tuition Trends at Minnesota Private College Council Member Institutions $14,469 $14,307 $14,469 Private colleges have also worked to control tuition costs. Average net tuition for firstyear students at Minnesota s private colleges has been flat for the last five years, and, when adjusted for inflation, has been flat for the last ten years. This has been possible because private colleges have been restraining spending while increasing institutional grant aid to students (See chart). 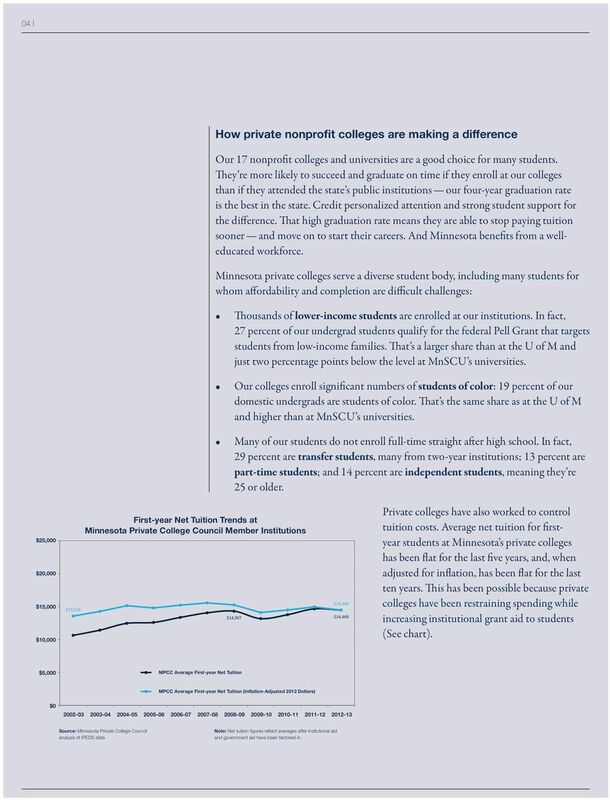 $5,000 MPCC Average First-year Net Tuition MPCC Average First-year Net Tuition (Inflation-Adjusted 2012 Dollars) $ Source: Minnesota Private College Council analysis of IPEDS data Note: Net tuition figures reflect averages after insitutional aid and government aid have been factored in. 5 An Agenda for College Affordability and Degree Completion 05 III. 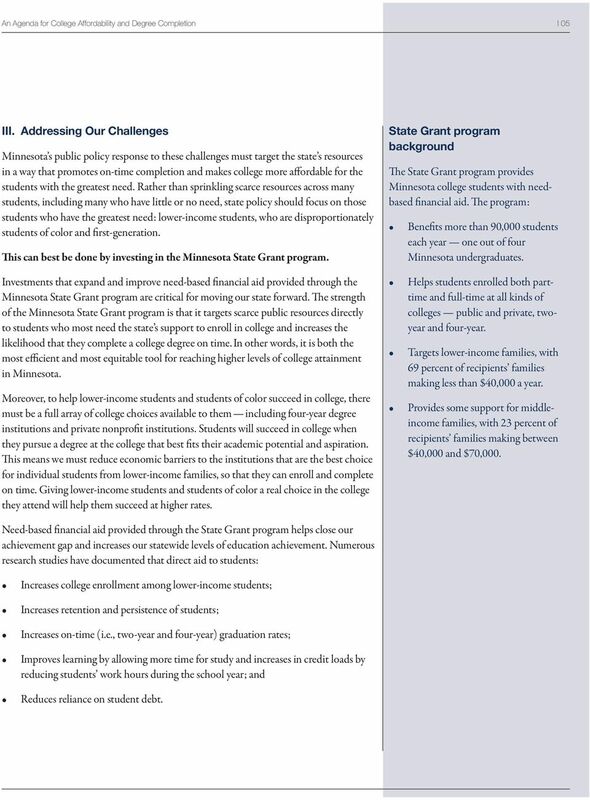 Addressing Our Challenges Minnesota s public policy response to these challenges must target the state s resources in a way that promotes on-time completion and makes college more affordable for the students with the greatest need. Rather than sprinkling scarce resources across many students, including many who have little or no need, state policy should focus on those students who have the greatest need: lower-income students, who are disproportionately students of color and first-generation. This can best be done by investing in the Minnesota State Grant program. Investments that expand and improve need-based financial aid provided through the Minnesota State Grant program are critical for moving our state forward. 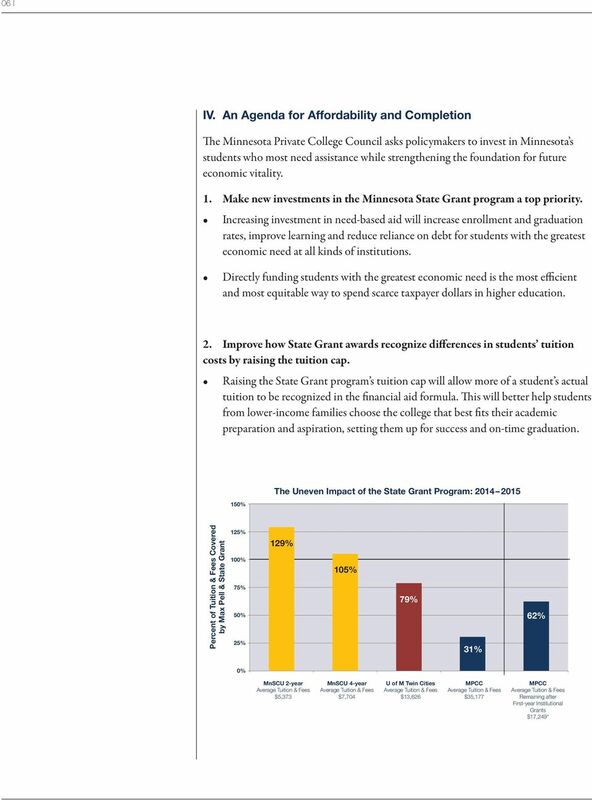 The strength of the Minnesota State Grant program is that it targets scarce public resources directly to students who most need the state s support to enroll in college and increases the likelihood that they complete a college degree on time. In other words, it is both the most efficient and most equitable tool for reaching higher levels of college attainment in Minnesota. Moreover, to help lower-income students and students of color succeed in college, there must be a full array of college choices available to them including four-year degree institutions and private nonprofit institutions. Students will succeed in college when they pursue a degree at the college that best fits their academic potential and aspiration. This means we must reduce economic barriers to the institutions that are the best choice for individual students from lower-income families, so that they can enroll and complete on time. Giving lower-income students and students of color a real choice in the college they attend will help them succeed at higher rates. State Grant program background The State Grant program provides Minnesota college students with needbased financial aid. The program: Benefits more than 90,000 students each year one out of four Minnesota undergraduates. Helps students enrolled both parttime and full-time at all kinds of colleges public and private, twoyear and four-year. Targets lower-income families, with 69 percent of recipients families making less than $40,000 a year. Provides some support for middleincome families, with 23 percent of recipients families making between $40,000 and $70,000. Need-based financial aid provided through the State Grant program helps close our achievement gap and increases our statewide levels of education achievement. Numerous research studies have documented that direct aid to students: Increases college enrollment among lower-income students; Increases retention and persistence of students; Increases on-time (i.e., two-year and four-year) graduation rates; Improves learning by allowing more time for study and increases in credit loads by reducing students work hours during the school year; and Reduces reliance on student debt. 7 An Agenda for College Affordability and Degree Completion 07 From the early 1980s until 2005, the tuition cap in the program was set substantially higher than the highest public institution tuition in order to take into account the general tuition subsidy that students of all income levels receive at public institutions. This policy helped equalize the state s support for low-income students at private institutions with the support given to similar students at public institutions. As a result, the state helped lower-income students have the same college choices as more affluent students. Restoring a higher tuition cap would return fairness to the program at a time when it is critical for student success. 3. Improve how the awards address living expenses, helping all State Grant students. The living expense level in the formula is currently below the federally-recognized level of poverty. It should be set at the poverty level for a single person for nine months. The formula should keep up with the real living expenses that students experience. Permanently setting the living expense allowance at the poverty level will help ensure that the formula adjusts to reflect a student s basic living expenses. 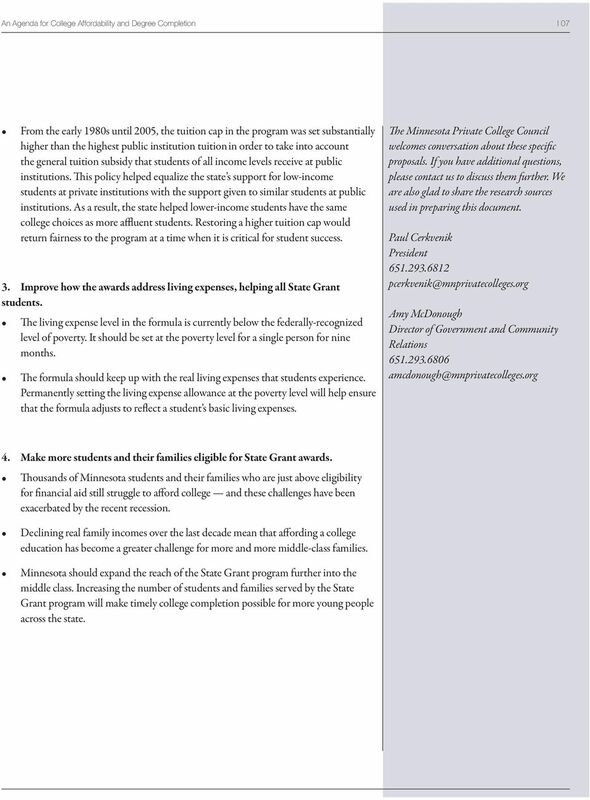 The Minnesota Private College Council welcomes conversation about these specific proposals. If you have additional questions, please contact us to discuss them further. We are also glad to share the research sources used in preparing this document. Paul Cerkvenik President Amy McDonough Director of Government and Community Relations Make more students and their families eligible for State Grant awards. Thousands of Minnesota students and their families who are just above eligibility for financial aid still struggle to afford college and these challenges have been exacerbated by the recent recession. Declining real family incomes over the last decade mean that affording a college education has become a greater challenge for more and more middle-class families. Minnesota should expand the reach of the State Grant program further into the middle class. Increasing the number of students and families served by the State Grant program will make timely college completion possible for more young people across the state. DELAWARE 2011 For a strong economy, the skills gap must be closed. Minnesota Measures 2007 Report on Higher Education Performance In our knowledge-based economy, Minnesota relies heavily on our higher education institutions to respond to change and keep our state competitive. IDAHO 2011 For a strong economy, the skills gap must be closed. WYOMING 2011 For a strong economy, the skills gap must be closed. KANSAS 2011 For a strong economy, the skills gap must be closed. Regional Profile Orange County. Category Preparation How prepared are students for college-level work? Category Preparation How prepared are students for college-level work? Participation How many students are going to college? This is compared to 13% by MnSCU 4 Year institutions and 39% for the University of Minnesota. Policy Alert PUBLIC POLICY AND HIGHER EDUCATION THE NATIONAL CENTER FOR STATE POLICIES ON 2/4 TRANSFERS ARE KEY TO DEGREE ATTAINMENT. January 2003 The Role of Student Loans in College Access Sandy Baum, Ph.D., Professor of Economics, Skidmore College Most discussions of student loans focus on the difficulties they generate for students. Minnesota Measures 2011 Report on Higher Education Performance To advance the promise of higher education to all Minnesotans and provide the critical information that guides higher education decisions. WEST VIRGINIA 2011 For a strong economy, the skills gap must be closed. MISSISSIPPI 2011 For a strong economy, the skills gap must be closed. Awards in health science programs are the most numerous across all academic levels. MARYLAND 2011 For a strong economy, the skills gap must be closed.